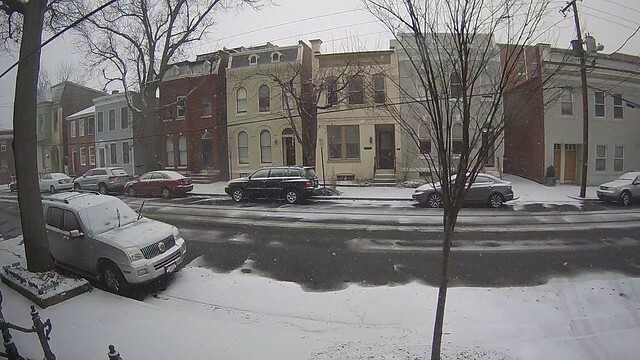 The live feed is still going down below, so be sure to scroll down to catch the latest look out our front window. However, it's been up and down this morning as the power and Internet has been on and off. Fingers crossed our flickers are behind us. Here's the full timelapse of the storm through 1/24 at 3:29 am. 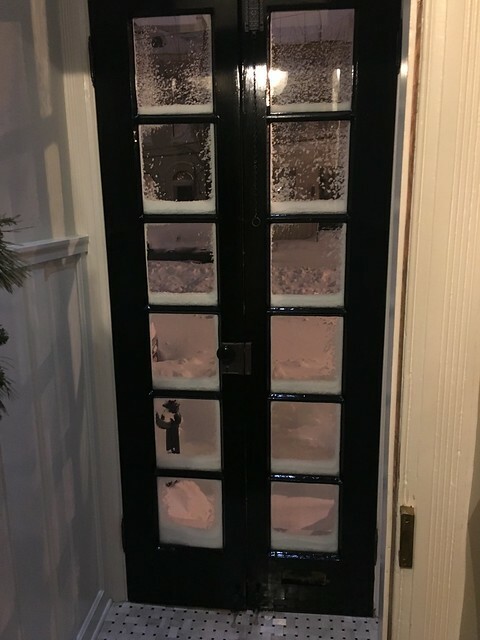 This storm was truly no joke. This morning people are trying to dig their cars out under the bright and sun filled blue sky. 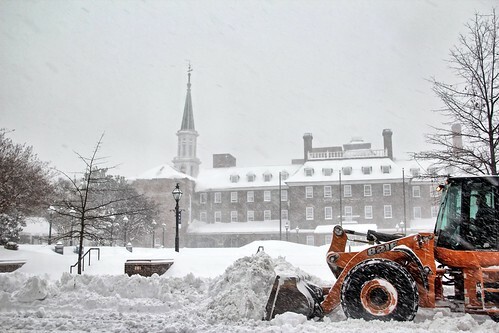 I'll tell you one thing, things are already getting a little bit testy between some of the diggers and those either looking for parking spots or trying to make some cash by digging people out. What a difference 24 hours makes. The blowing and drifting in this storm is insane. 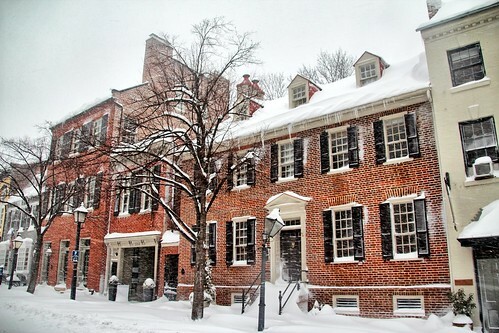 While we have power in Old Town, our power at the other house went out this morning at 5:00am. We received an email alert from the security monitoring company letting us know of the outage, which is a great feature of the service. We were also able to check on the power company's website to see that the outage for the area was already reported and they are working to restore the power. 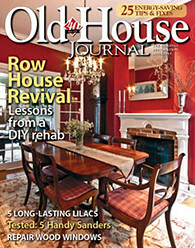 Not sure how long it will be out, but glad to know it's not just our house. Fingers crossed it's sooner than later. But I can say that Mel's glad he's here and not there. Here in Old Town I'll probably venture out for some more photos this afternoon. It's so wonderful and bright out there I definitely don't want to miss it. Also, maybe now that it's not blowing snow my phone won't freeze and I can Periscope something. Yesterday's attempt left the phone frozen. As in, it shut down and wouldn't turn back on due to the cold. It's happened several times when I've been outside over the last few days. Anyhow, here are a few more of my favorite photos from yesterday. Here's Columbia Firehouse on South St. Asaph Street during the most blustery part of the storm just before sunset. This is a photo of two of our favorite houses on Duke Street. They're on our "favorites" list because they are basically our house. The one on the left has an identical interior floorplan to our house. The main difference is the front bump out and double windows that we so wish our house had. This home is on the upper portion of Captain's Row on Prince Street has a massive wisteria vine that's so huge it wraps up through the large tree and blooms high in the tree's canopy. 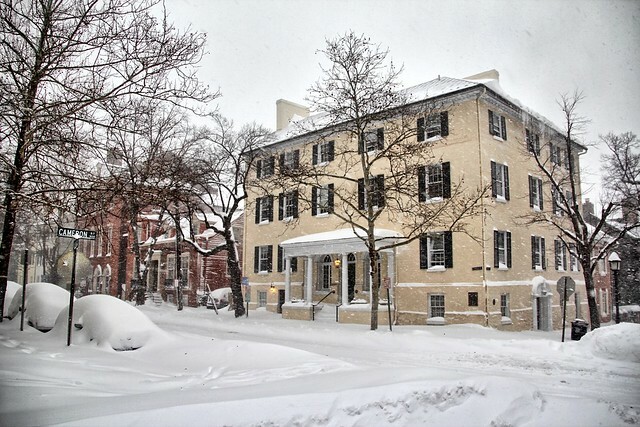 Yesterday, there's essentially no evidence of the vine, just beautiful home in the midst of a major blizzard. 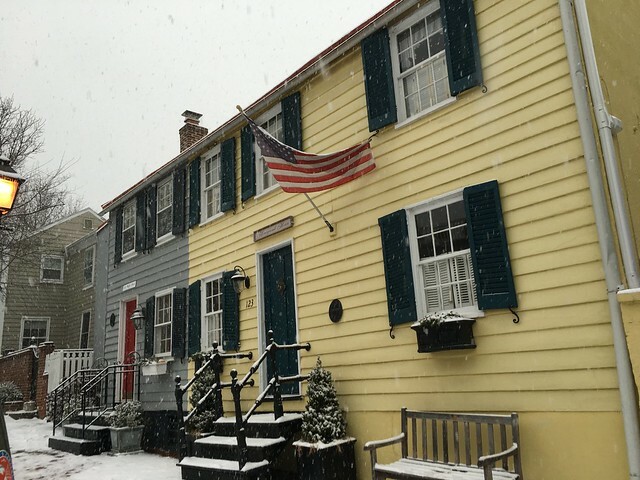 The corner of Cameron and Fairfax Streets house some of the oldest buildings in Old Town, including Wise's Tavern. 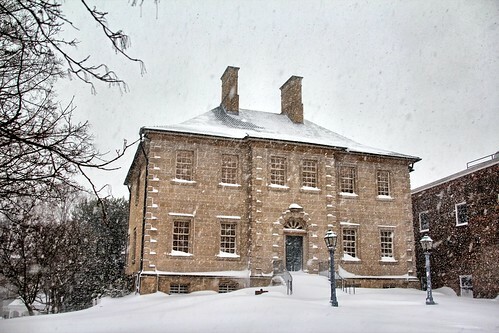 Wise's Tavern was the location where George Washington's election as President was celebrated and he was addressed for the first time as "President." 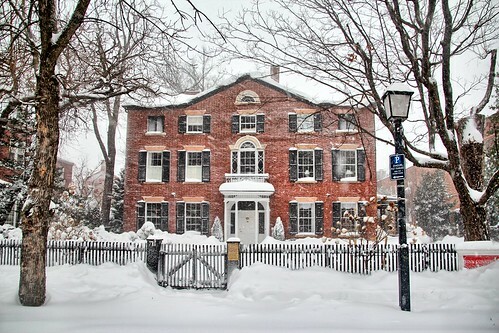 Lower on Cameron Street is a collection of beautiful homes, including a very lovely place that belongs to a friend of ours. 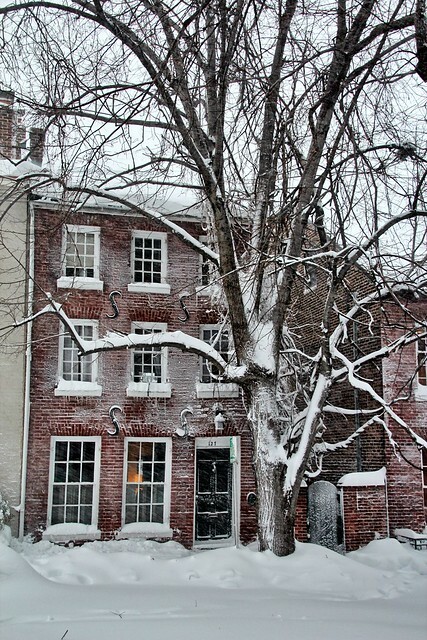 And no tour in the snow would be complete without my favorite home on Prince Street. It's been under renovation since it sold last year, but the front facade has been unaltered throughout, keeping it just as amazing as it's always been. But the final photo I want to leave you with is a man that has ultimate dedication. 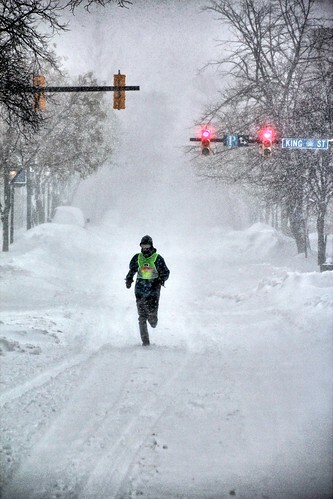 I found him out on just Saturday jog amidst 35+ mile per hour winds, driving snow, and nearly impassable roads. Sure, why not go for a run. Just gotta throw on some ski goggle and a hat. This storm has been nothing less than an adventure, and it's been a pretty amazing one. 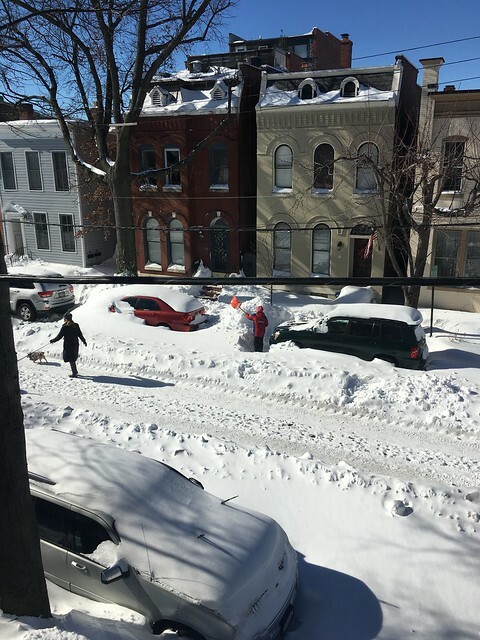 I have no idea how long it will take us to dig out, but I just took a look at our car and I don't think we're going anywhere anytime soon. What are the odds we have work tomorrow? I'd say pretty low. Man, what a crazy storm this has been. 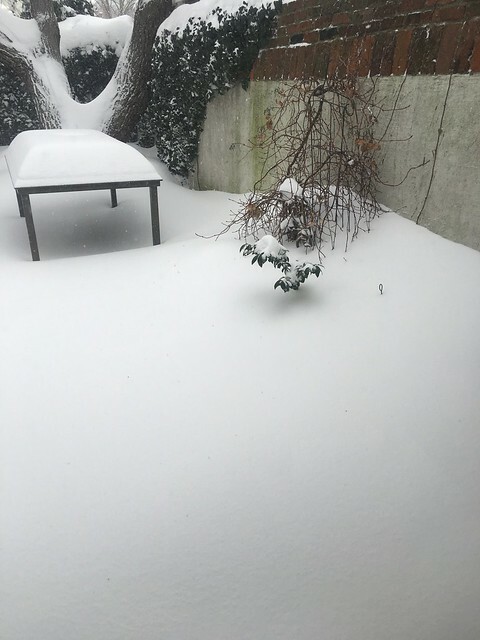 We had a lot of snow on the ground when we woke up this morning, but it seemed like it wouldn't be a crazy storm, just a lot of snow. But by about 3:30pm, everything really picked up. The wind started blowing, snow was really driving, and it seemed like a pretty great time to venture out for a walk with Lulu. 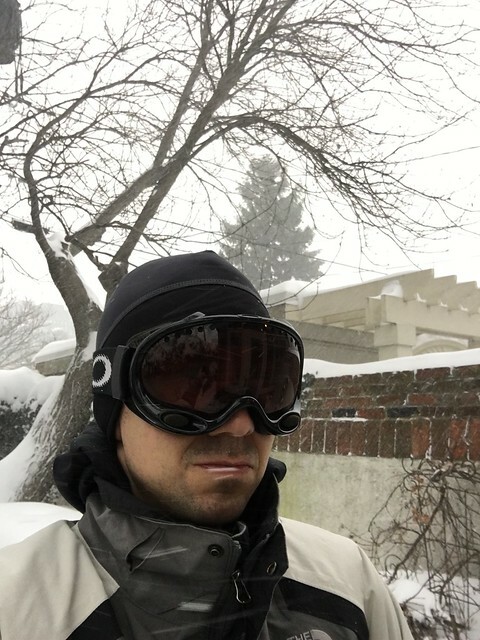 I put on about eight layers and all my ski gear to head out. This is a blizzard, not a fashion show. And while it may look like I'm scowling, my heart is jumping with joy from all of this snow. 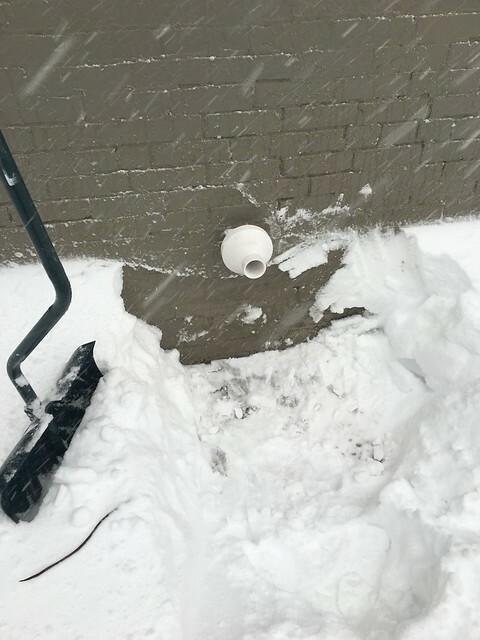 The first thing I did was shovel the snow around our tankless water heater's vent. 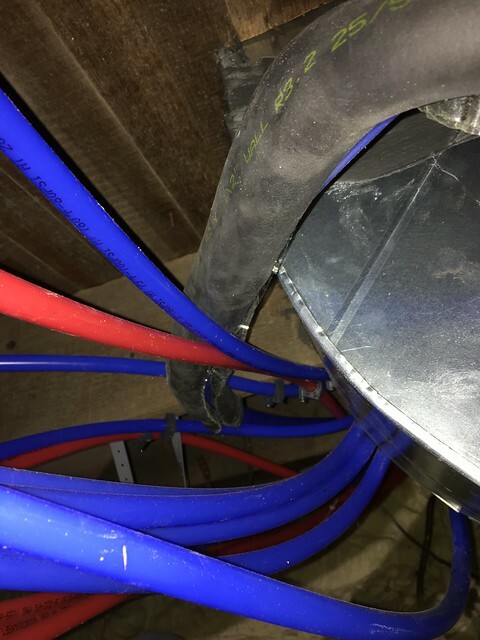 This needs to stay clear or we could have a major problem (and no hot water). 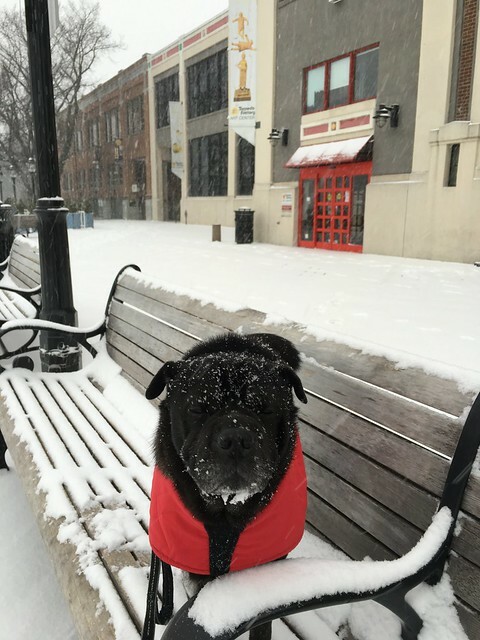 Unfortunately, Lulu is not a fan of the snow that's deeper than she is, and we only made it to the corner before she wanted to head back inside. I figured I was already bundled up, so why not head out for a long walk. I spent about two hours walking all over Old Town and took some photos I really love. Here are a handful of my favorites. I saw a lot of crazy things while walking around. People out for a run, many stuck cars, armies of people shoveling, and lots of wide open roads where it was easier to walk than the sidewalks. 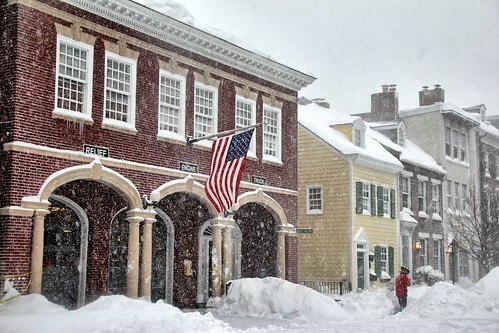 The firehouse on Prince Street was fully shoveled, and one of the firefighters was actively shoveling to stay ahead of the rapidly falling snow. King Street was pretty much dead, and there were no cars parked along King. 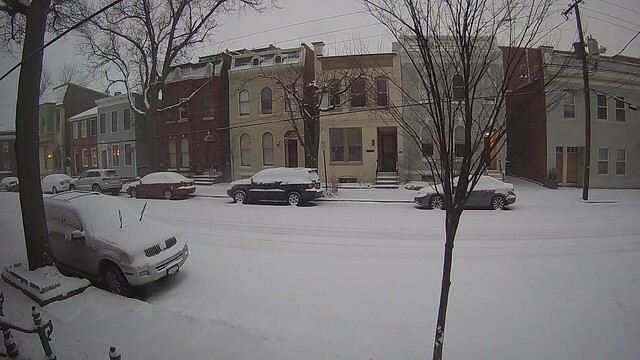 I think it's a snow emergency route, so no cars are allowed to be there, but it was a strange sight to see when the street is normally lined with parked cars. 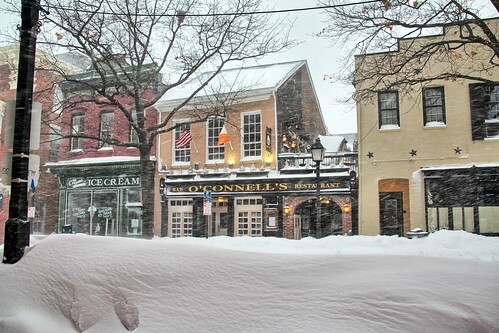 In spite of massive snow drifts, many restaurants, bars, and pubs were open, including O'Connells. 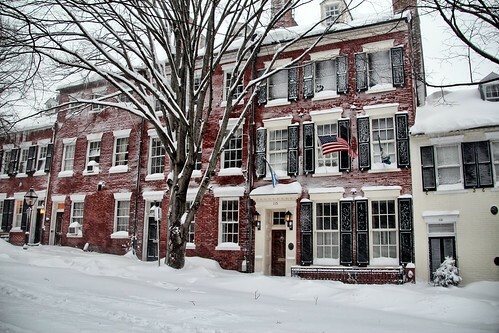 Lower King Street had more going on and was pretty well plowed. News crews were setup there for their live shots, and it was generally a gathering place for neighbors. Major snow moving equipment was out in force in front of City Hall. 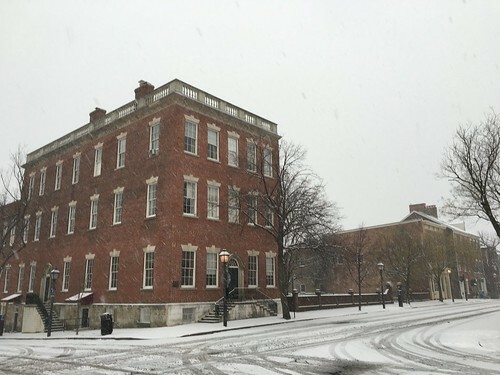 But for me, the main attraction was off of King Street and on the side streets. Cameron was looking quite picturesque. 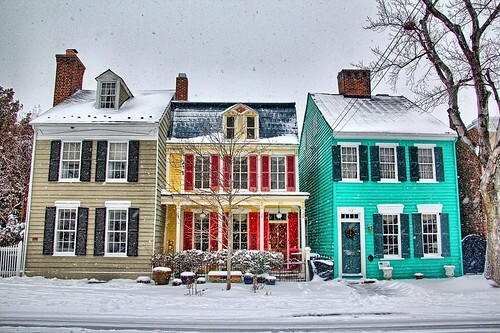 Captain's Row also had no shortage of beautiful snowscapes. It was great to see it all with no cars. 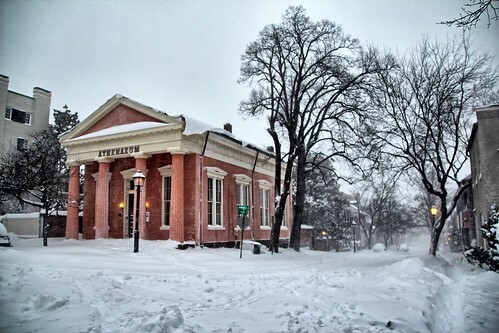 In the snow I like to think Old Town looks a lot like it did 100 years ago. No visible pavement, often no cars, it's just peaceful. 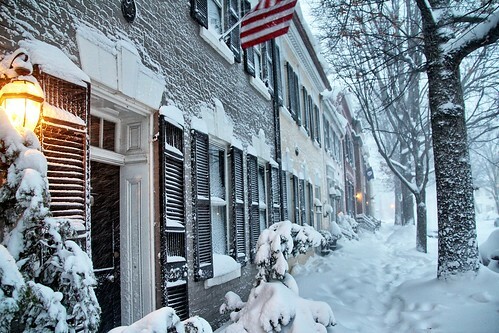 Everywhere I'd turn it was just another wonderful setting that made me appreciate where I am able to spend this storm. 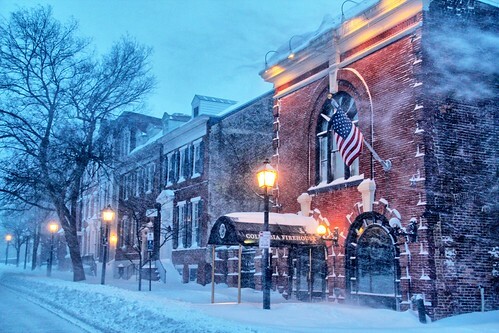 The streets of Old Town are truly a magical place. And no major storm would be complete without a strong showing from the Old Town Rats on Lee Street. 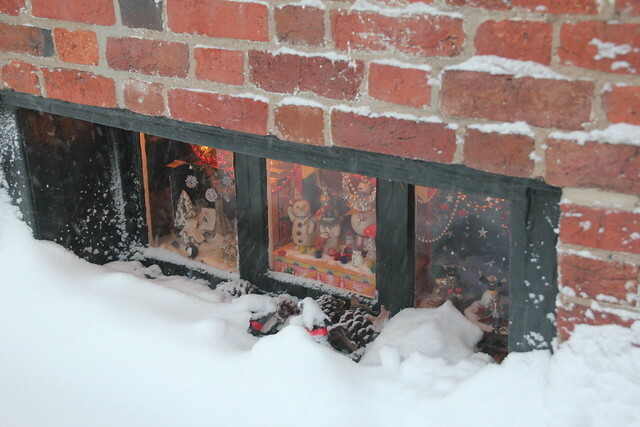 They may be a little snow covered, but they are enjoying their basement window show. In addition to the live feed, I've been grabbing image captures from the camera every minute to assemble a timelapse. Good news, the process worked all of the way until about 4:00am. Bad news, I'll have a gap from 4:00am to 8:00am in my final video. 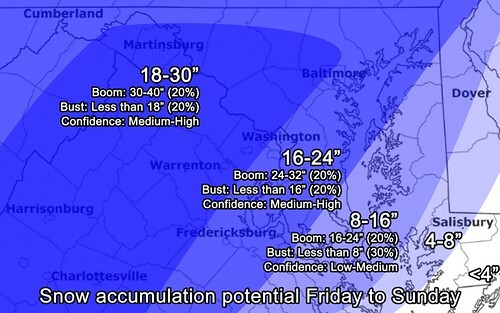 But before we get into the update, here's the first roughly 12 hours of the storm. So far this storm is going well. Fingers crossed the wind doesn't start to cause havoc later today. Last night we did our best to enjoy the calm and quiet of the storm. 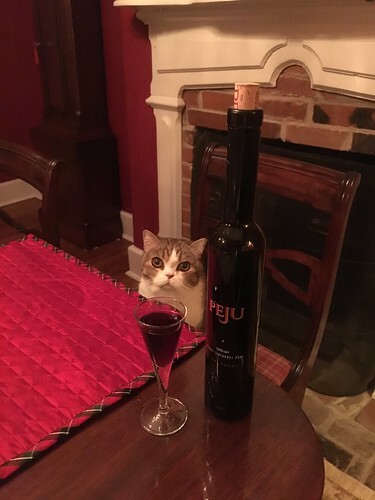 And as promised, after finishing up working for the day at about 9:00, Wendy cracked open our favorite bottle of Peju Zinfandel port we bought about 3 years ago and have been saving. 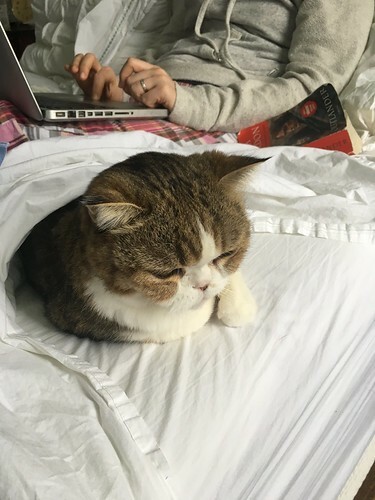 Mel tried to get in on the action. While we're not at the other house, we're trying to keep an eye on things with web cams, temperature monitoring, and general paranoia. But late last night our web cam and remote thermostat went offline and we started to get nervous that we lost power. That's our achilles heel with this storm. I think we're okay as long as we have power, but if we don't have power, the house will get cold quickly. We've tried to prep by shutting off water, releasing pressure, etc., but we're still understandably gun shy after last year's freeze. The good news is that while the Internet was down, we could check our security system remotely since it uses cell coverage, and we could see that the power was still up (the security system would alert us to a loss of power as well). Also good news, Comcast now allows you to check status of your service and even remote restart your router. I did this just before bed last night and by the time I woke up this morning the web cams were back online and everything at the house looks good. We'll certainly be keeping our eye on the water as the wind picks up and storm surge/high tide begins. Here in Old Town we've certainly gotten our fair share of snow. It's pilled up on all of our window sills and is looking particularly "classic old house". The backyard is completely full of snow to the point where we can't even see the pond or plantings. I took a tape measure out and measured a few places. 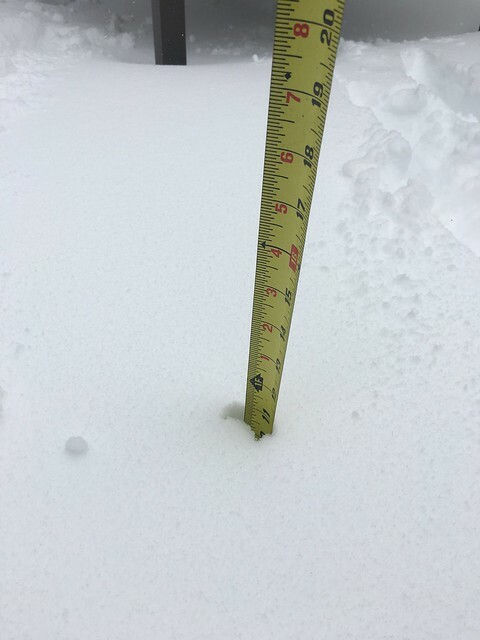 While official measure in Alexandria is 17" of snow so far, we seem to only have about 11"-12". I think the drifting in the back yard is uncovering a lot of places. But my favorite part of the morning was Lulu bounding out through the snow like a deer or a rabbit. She's hysterical, and I can't wait to take her on a good walk later. We've got some major drifting and hopping like a deer going on in the back yard! 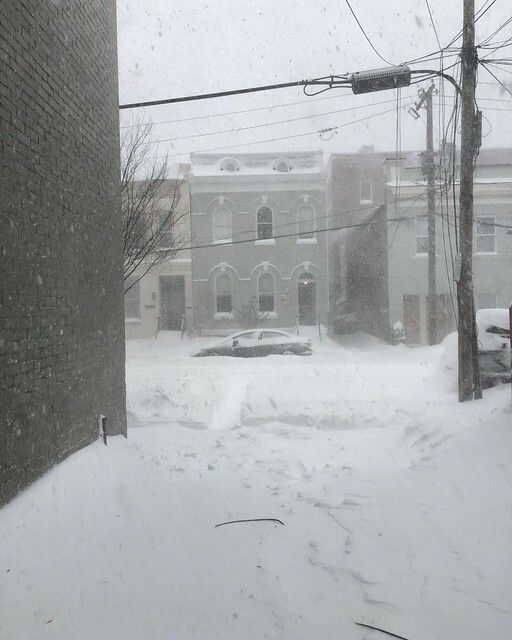 It's still coming down out there, and the wind is starting to pick up a little. We hear trucks and shovels hard at work clearing the snow, but I think those are largely private plows or those on snow emergency routes. And with that, I need to get out there and start shoveling too. We'll be back later with more updates. 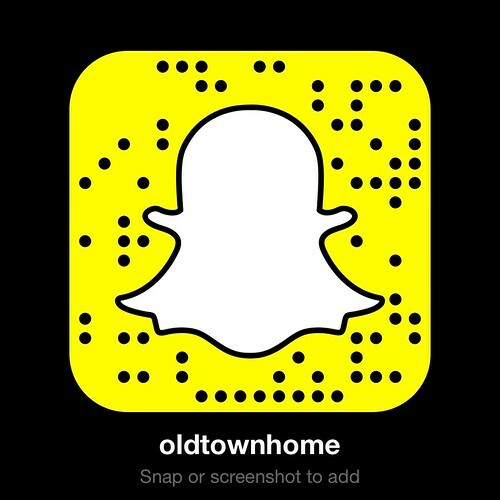 You can also keep up with us on Instagram, Snapchat, Twitter, or Facebook. Snow started falling pretty steadily in our neck of the woods at about 1:30pm and began sticking pretty much immediately. By 2:30pm we already had coverage on the sidewalks and around parked cars. We're just a few hours in and we already have about 4" if snow on the ground. Just before the sun set at 5:00pm the roads are completely covered and cars are few and far between on the road. Lulu and I decided to talk a little walk around town to see how Old Town is doing so far. What we found...snow...and lots of it. It is really coming down, easily 1" per hour that they were calling for. We shared a bunch of stuff on our Snapchat account, so be sure to add "oldotwnhome" to catch up on our story. Makes me feel like such a Millennial. While on our walk we did a lot of walking in the middle of the road, since you can do that around here during snow storms. And we also did a lot of oohing and aaaahhhing at all of the beautiful old houses in Old Town covered in a light and fluffy blanket of snow. 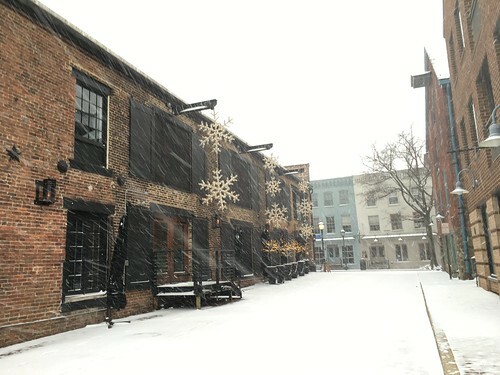 Walking around in Old Town during a snow of any volume is always a treat. Here's a shot of what's left of the Mansion House Hotel, subject of the new PBS show, Mercy Street. I am mad that we forgot to order Lulu little dog boots because she always has what we call "blow outs." She'll be walking along and then suddenly starts hopping around with one paw in the air. This is usually caused by either ice or salt getting stuck between her paw pads. When I see it, we stop and I clean her paw, then she's back in business be-bopping along. She loves the snow so much and has so much fun bouncing around, a blow out or two certainly won't deter her. But with all of the salt on the sidewalks it means we have to wash her paws when we get home, and also try to choose routes with hopefully a little less salt on the sidewalks. 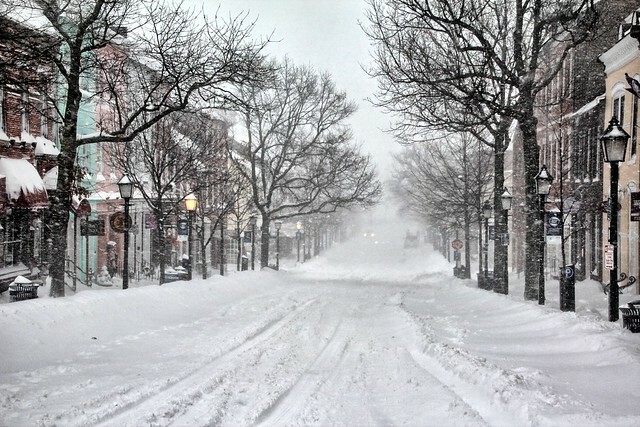 One final image I want you leave you with is thanks to the recent trend to name every major snow storm we get. 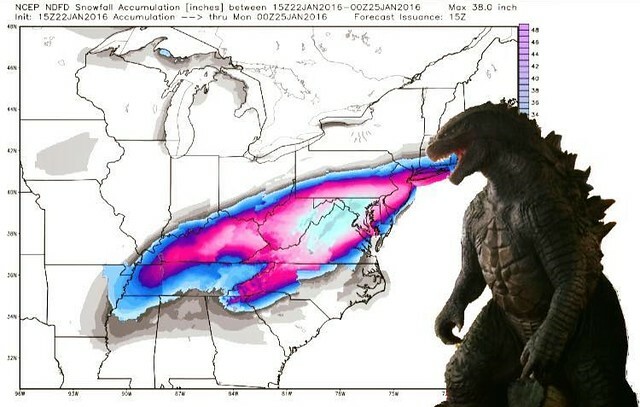 You've likely heard Snowmageddon, Snowpocalypse, etc, for previous storms, and while some are calling this storm "Jonas," and this year the Capital Weather Gang weather blog has named this storm Snowzilla for the DC area. And they have a pretty awesome image accompanying the popular nickname. Feast your eyes on this beauty. We're hunkering down for the night and trying to pick something great for dinner. 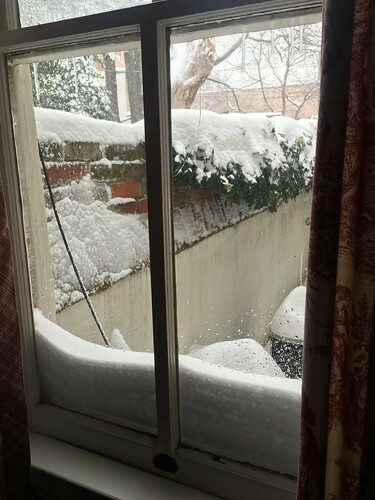 Wendy has also declared this snow emergency in need of a bottle of port for after dinner. I have no objection to her emergency plan. Will have to let you know how it turns out. As a kid from Cleveland living on the east coast, I get giddy with excitement when even a chance at a snow storm is predicted. Earlier this week, I think it was Sunday, when the news weather people started talking about a possibly giant snow storm nearly a week off, my head almost exploded! 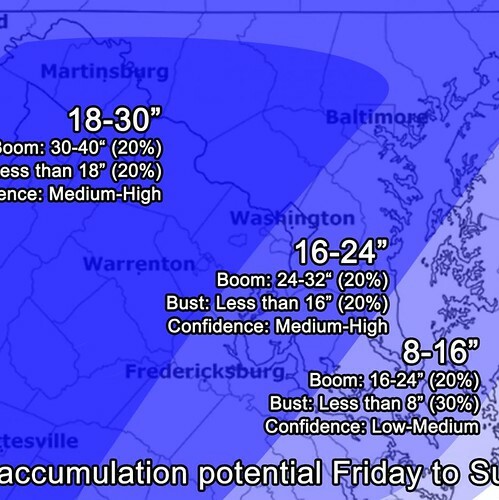 I thought, "Would we possibly have a legit shot at a large snow storm?" As it turns out, we certainly did...and do. The looming blizzard is quickly moving into the region and promised to potentially be a "Storm of the Century!" 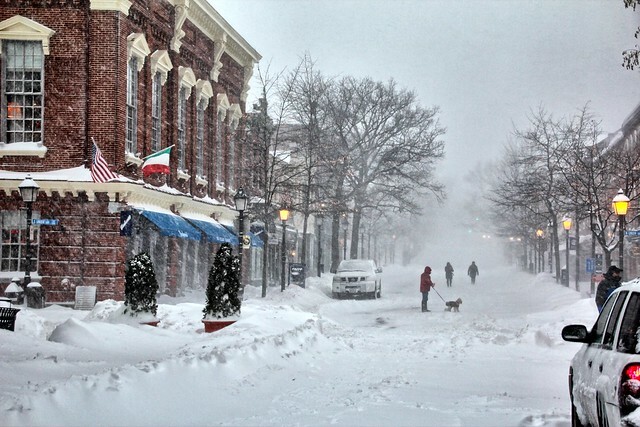 We've seen predictions of 30"+ of snow, blizzard conditions, and nearly 48 hours straight of snow. As a result, we'll be live blogging the whole event. And that includes a YouTube Live Stream from our front window! As the snow starts you can follow along with the snowfall amounts we're seeing. 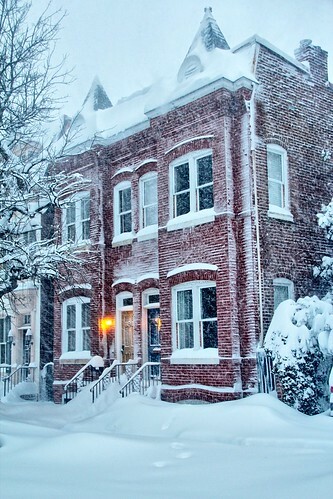 I'll also be venturing out into the snow to take some photos in and around Old Town. 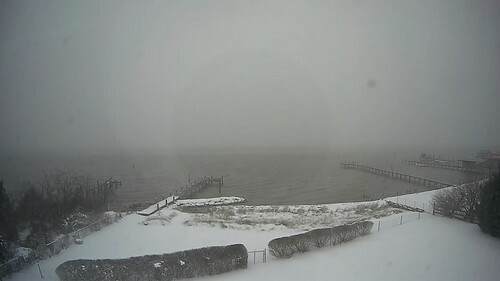 (Unfortunately Wendy will have to hold down the fort as she's on crutches and won't be heading out into the snow and ice.) There's really nothing more peaceful than some great snow shots in our city. I love some of our photos from past storms. And finally, we'll surely be giving updates on Pat Collins and the Pat Collins Snow Stick! I love that guy. He's a DC Institution. I did a bunch of work yesterday to hopefully prepare for worst case scenarios, like adding some additional insulation to pipes. Nothing like spending an evening insulating under your house to get ready for a major snow storm. 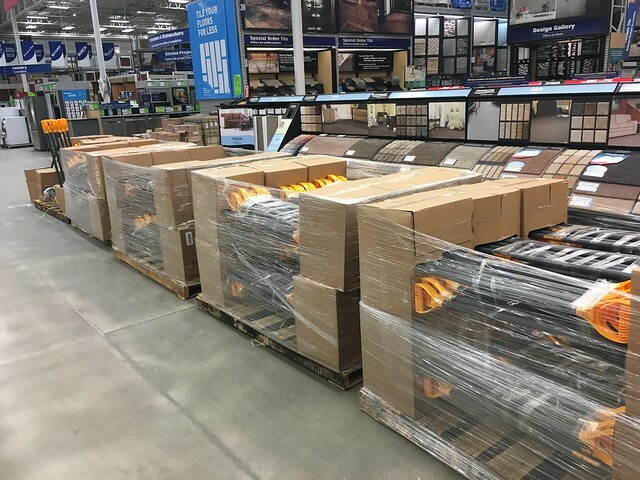 And I also stopped at Lowe's and was flabbergasted by the number of shovels they had on hand. 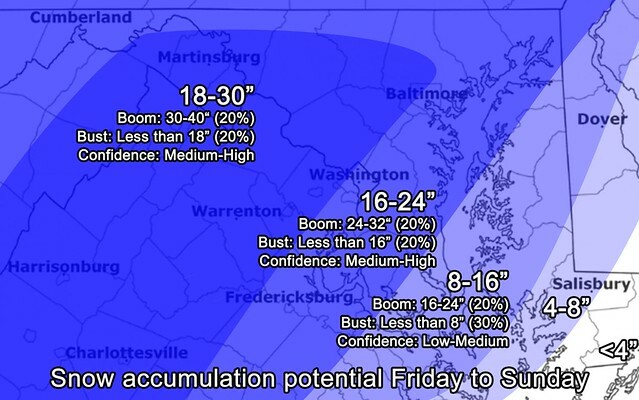 But the snowfall prediction map has me floored with a mix of anticipation, excitement, and paranoia. Stay tuned as thinks take shape! As long as we have power we'll be updating. Check back for updates throughout the day today, tomorrow, and Sunday. Awww, I miss Old Town! 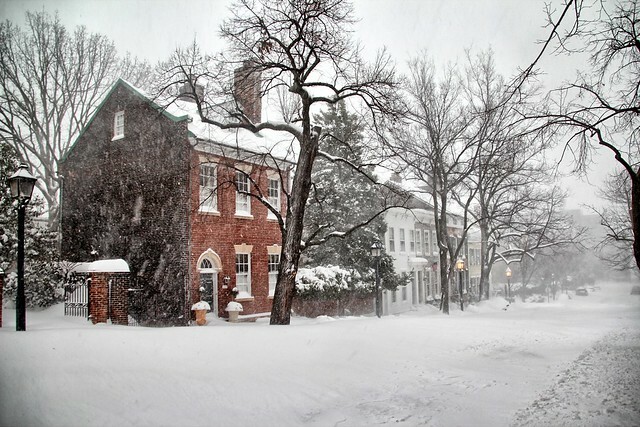 Del Ray is also pretty freaking gorgeous in the snow, though. The Boy and I have already scraped off his car once--this girl who grew up in South Dakota knows not to wait until after the storm is over to start shoveling when it's one of these big ones! Looks like Lulu will now need snow shoes! As compared to snowmageddon or snowpocalypse. 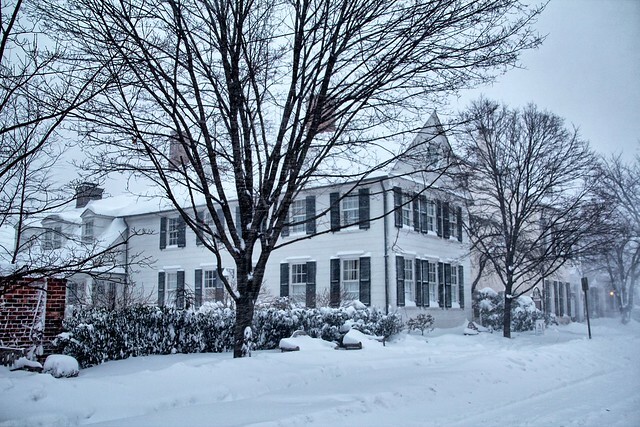 Snow started in Fredericksburg around 11:30 a.m. and picked up quickly. We are ahead of you, but you should see it starting soon if not already. Our streets are covered and it is coming down fast. Will you tell me when I need to start worrying about my flat roof?! No sooner than we hear ours creaking.